Hotel NvY is part of a rather unique hotel chain. The Swiss Manotel Group to which it belongs, consists of just six hotels; every one is in Geneva and all sit cheek by jowl within just a few hundred yards of each other. This is the Paquis district of the Rive Droite (right bank) of the Rhone as it flows from the west end of Lac Leman. It’s a particularly convenient spot just back from the lakeside and close to historic grand hotels like the Hotel du Rhone, Richemond and Beau Rivage. The station is also at hand, whilst the airport only a little farther, is about a fifteen minute drive away. It is a richly multicultural district with a wealth of varied small bars, cafes and restaurants. Pick for example from authentic Arabic, Thai, Turkish, African, Mexican and South American cuisine. Try Lebanese fast food or grab a take away pizza. The district closely reflects the chain’s ethos. Manotel has a portfolio of 3 and 4 star hotels that offer clearly distinct characters. Each is summed up with a few words or a concise phrase and you can take your pick according to your mood. There is “Tradition on the move” for The Royal, “Design and Hospitality” at The Auteuil, “Invitation to Travel” at The Kipling, the “Arty, Cosy, Trendy” N’vY Hotel, “Feng Shui Harmony” for The Jade and “Mountains in the City” at The Edelweiss. We selected the arty and cosy N’vY Hotel – ‘where energy and emotion intermingle to offer a BoHo chic-inspired lifestyle’. We should immediately advise that anyone with an aversion to bright colours and bold design should stay well away. This is a place where more is most definitely more. Stepping inside from an unassuming, modern frontage the visual feast begins immediately. 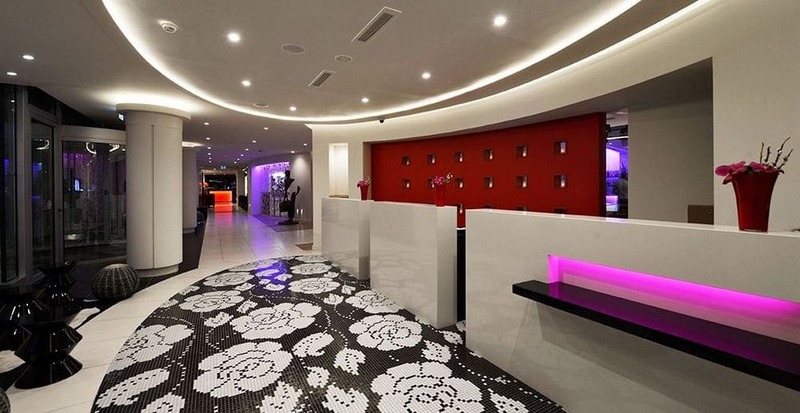 A flowery tiled floor lies adjacent to a check in desk in white, red velvet and concealed coloured lighting. The illumination here continuously changes in to a variety of rainbow shades, as it also does at the two bars – coffee and cocktail – which also sit just off the lobby. There are cactus stools, custom graffiti walls and pop art style paintings and sculpture. Artworks of musical icons like Mick Jagger, Jimi Hendrix and the Doors are accompanied by a collection of guitars which fill cabinets in the hallways. The discretely lit bedroom corridors are very stylish – patterned in black, white and red with bright artworks – the black doors leading in to brightly lit rooms with white walls and spot colours. The ultra modern theme is continued inside in lighter colours with white, cream and beige predominating. ‘Floating’ beds and wall mirrors were back lit with coloured light – adjustable according to mood whilst spot colour was supplied by brightly coloured pop-style art, flowers and sofa cushions. Our bathroom was open plan with a big bath/shower (modesty curtains available) and a slick bathroom with ultra modern fittings. There was lots of nice toiletries and the room came with nice extras like Nespresso machine and complimentary water. The cocktail bar seemed to be well used with a young crowd enjoying the trendy vibe. The Trilby restaurant was reasonably priced (for Switzerland) and served a moderate variety of interesting cuisine. Main courses might include Asian style red tuna, grilled scallops or vegetarian lasagne. An excellent stay in a slick and efficient hotel. Next time? Maybe Feng Shui Harmony at The Jade or will it be some mountain style at The Edelweiss – we shall see! Images by CELLOPHANELAND* and Hotel N’vY.